The Anglo-Saxon period was a time of bloody conflicts, ignorance, violence and barbarism and life was difficult (Allen et al. 23). The first person to ever write about England may have been Roman general Julius Ceasar, who attempted to conquer the British Isles in 55 B.C. (Allen, et al. 23). The Angles and Saxons began arriving from northern Europe arounf A.D. 449, along with other Germanic tribes and later became known as the Anglo-Saxons (23). Soon the Anglo-Saxons settled in the main part of Britain and re-named it Angle-land, or England (23). The Anglo-Saxons brougt oral poetry with them and much of it was the form of narratives praising heroic deeds of warriors, which soon brought the epic poem, 'Beowulf' to life ("Old English..."). 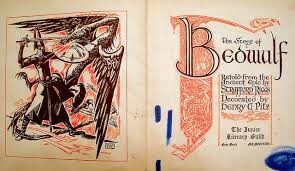 Beowulf is the oldest surviving epic poem in English, and was intended to capture the listening audience's attention that was originally chanted or sung aloud by a group of poet singers, called scops (Allen et al. 40). Unfortunatley, we do not know who the poet was that composed Beowulf, but scholars assume that the poet may have lived between the middle of the seventh century A.D. and the end of the tenth century (40). The work begins with the funeral of a great king and legendary founder of the Danish royal dynasty and ends with another great king's funeral ("Beowulf"). Herot, a lavish mead that id run by Hrothgar, soon becomes under attack by a monster named, Grendel. Beowulf defends Herot and defeats this evil monster, but that is not the end. Grendel's mother comes seeking revenge from Beowulf and they soon battle it out as well. He defeats her and is named hero and soon rules Herot as Hrothgar did. Fifty years pass and soon there is another monster to defeat, a dragon. Of course, Beowulf comes out victorious on defeating the dragon, but he ends up being defeated as well, and he is killed ("Beowulf"). The Geats, who Beowulf came from, gather to see their hero and the dragon one last time. They bury Beowulf in a tomb, along with all of his treasure, and then push the dragon's remains into the sea ("Beowulf"). Ninety-foot long, clinker-built wooden ship of the 7th century: Contained a rich burial of Raedwald, leader of the Wuffing dynasty of the East Angles ("Beowulf" 1). Bodies: Martin Carver discovered thirty-nine burials, some appearing as 'sand bodies' that were interpreted as execution burials of probably the 8th-11th centuries ('Beowulf" 2). Footprint of the planned National Trust Visitor Centre: revealed nineteen inhumations and seventeen early Anglo-Saxon cremations. Ditches were found and at least three of them contained a significant amount of burnt bone deposit which suggests they may have been backfilled with pyre material at their creation ("Beowulf" 3). Barrow Cemetery: Eight inhumations showed the vertical edge of coffins within the grave stratification and some degree of the bodies were bloodstained and every burial contained weapons, for men, and brooches or bead assemblages, for women ("Beowulf" 4). "The Anglo-Saxon period was a time of bloody conflicts, ignorance, violence and barbarism and life was difficult" (Allen et al. 23), which directyly connects with our glory seeking hero Beawulf, who is a barbarian and used violence to win all of his bloody conflicts with his rivals. Also the Anglo-Saxons brougt oral poetry with them and much of it was the form of narratives praising heroic deeds of warriors ("Old English..."), which the scops would perform out loud for Herot and their noble ruler, Hrothgar. I feel as if the story directly connects to all of the things I have researched. 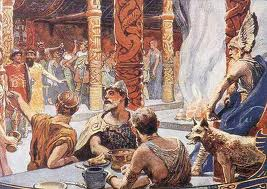 There are very similar traits and characteristics of the Anlgo-saxons and the people of Herot. It's kind of ironic how the scops would tell stories of brave heroes, like Beowulf, and in this peom, they tell heroic stories of their own. By knowing the background and historical context helps clarify how people lived and acted in every day life and also helps to further understand this epic poem. This is an amazing poem that lives throughout the decades, entertaining many.